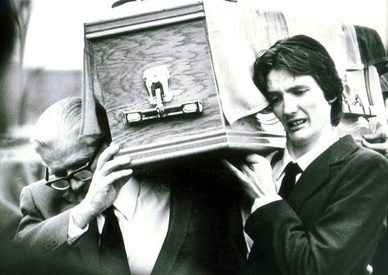 At 1.17 a.m. on Tuesday, May 5th, Bobby Sands MP died in the prison hospital on the after 66 days of hunger-striking, aged 27, prompting rioting in nationalist areas of Northern Ireland. The original pathologist's report recorded Sands' and the other hunger strikers' causes of death as "self-imposed starvation", later amended to simply "starvation" after protests from the dead strikers' families. The coroner recorded verdicts of "starvation, self-imposed". Humphrey Atkins issued a statement saying that Sands had committed suicide "under the instructions of those who felt it useful to their cause that he should die". 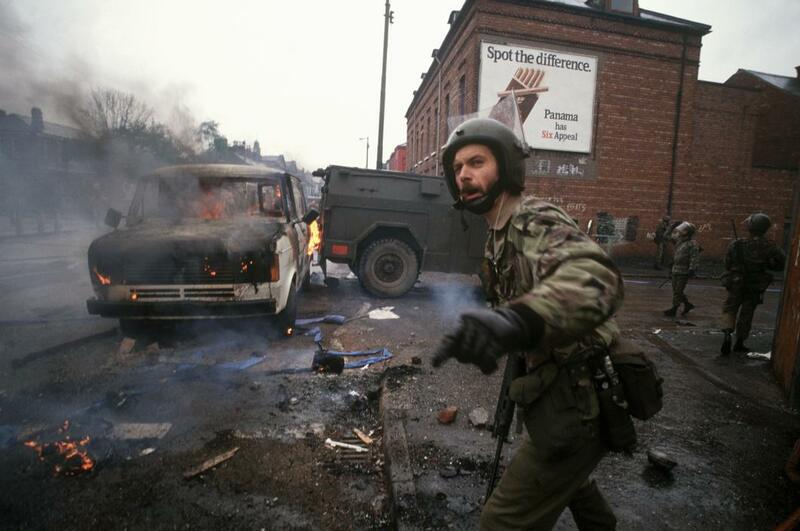 The announcement of his death prompted several days of riots in nationalist areas of Northern Ireland. A milkman and his son, Eric and Desmond Guiney, died as a result of injuries sustained when their milk float crashed after being stoned by rioters in a predominantly nationalist area of north Belfast. 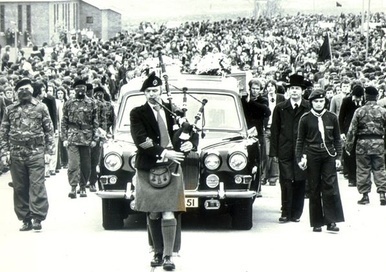 Over 100,000 people lined the route of Sands' funeral, which was conducted with full IRA military honours, and he was buried in the 'New Republican Plot' alongside 76 others. Their grave is maintained and cared for by the National Graves Association, Belfast. Sands was a Member of the Westminster Parliament for 25 days, though he never took his seat or the oath. In response to a question in the House of Commons on 5 May 1981, British Prime Minister Margaret Thatcher showed no regret and said, "Mr. Sands was a convicted criminal. He chose to take his own life. It was a choice that his organisation did not allow to many of its victims". The official announcement of Sands' death in the House of Commons omitted the customary expression of sense of loss and sympathy with the family of the member. He was survived by his parents, siblings, and a young son (Gerard) from his marriage to Geraldine Noade. 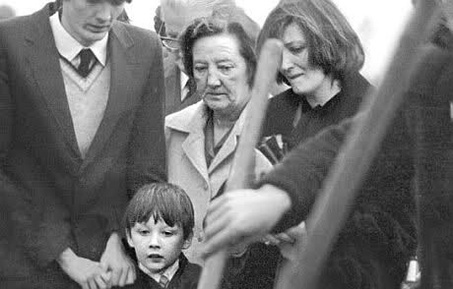 Bobby Sands’ mother, son Gerard and sister Marcella, pictured at the hunger striker’s graveside. In Europe, there were widespread protests after Sands' death. Five thousand Milanese students burned the Union Flag and shouted 'freedom for Ulster' during a march. The British Consulate at Ghent was raided. Thousands marched in Paris behind huge portraits of Sands, to chants of 'the IRA will conquer'. Many French towns and cities have streets named after Sands, including in Nantes, Saint-Étienne, Le Mans, Vierzon, and Saint-Denis. In the Portuguese Parliament, the opposition stood for Sands. In Oslo, demonstrators threw a tomato at Elizabeth II, the Queen of the United Kingdom, but missed. (The 28 year old assailant claimed however that he had not aimed for the queen, but for a smirking British soldier) In the Soviet Union, Pravda newspaper described it as 'another tragic page in the grim chronicle of oppression, discrimination, terror and violence' in Ireland. Russian fans of Bobby Sands published a translation of the "Back Home In Derry" song ("На Родину в Дерри" in Russian). In the Republic of Ireland, his death led to riots and bus burning. IRA members allegedly unsuccessfully attempted to coerce proprietors of shops and other businesses into closing for a national day of mourning. The West German newspaper Die Welt took a negative view of Sands. At Old Firm football matches in Glasgow, Scotland, some Rangers fans have been known to sing songs mocking Bobby Sands to taunt fans of Celtic. Rangers fans are mainly Protestant, and predominantly sympathetic to the Unionist and Loyalist community; Celtic fans are traditionally more likely to support the Nationalist and Republican community. 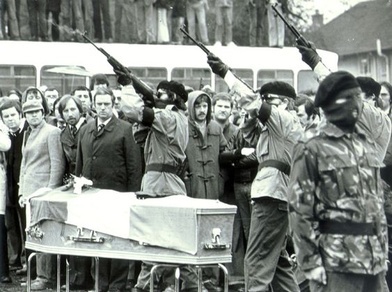 Celtic fans regularly sing the republican song "The Roll of Honour" which commemorates the ten men who died in the 1981 hunger strike, amongst other songs in support of the IRA. Sands is honoured in the line "They stood beside their leader - the gallant Bobby Sands." Rangers' taunts have since been adopted by the travelling support of other UK clubs, particularly those with strong British ties, as a form of anti-Irish sentiment. 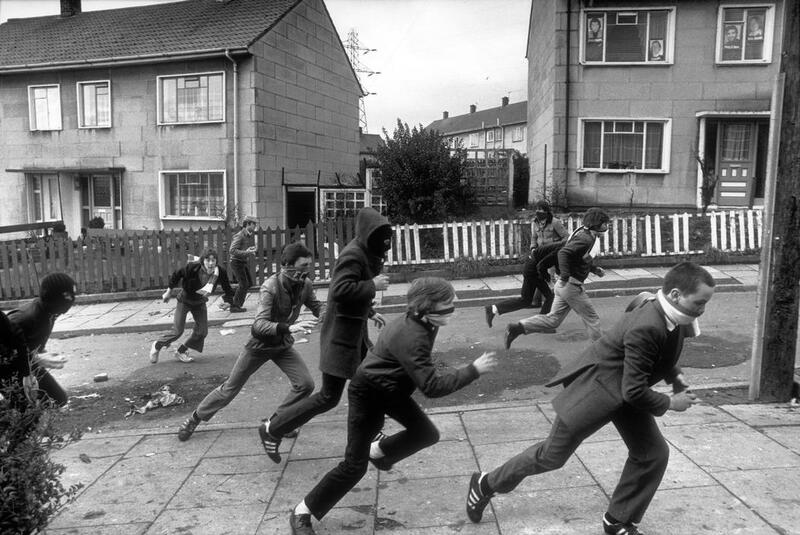 The 1981 British Home Championship football tournament was cancelled following the refusal of teams from England and Wales to travel to Northern Ireland in the aftermath of his death due to security concerns. Cardinal Basil Hume, the head of the Catholic Church in England and Wales, condemned Sands, describing the hunger strike as a form of violence. However he noted that this was his personal view. The Roman Catholic Church's official stance was that ministrations should be provided to the hunger strikers who, believing their sacrifice to be for a higher good, were acting in good conscience. The US media expressed a range of opinions on Sands' death. The Boston Globe commented that "[t]he slow suicide attempt of Bobby Sands has cast his land and his cause into another downward spiral of death and despair. 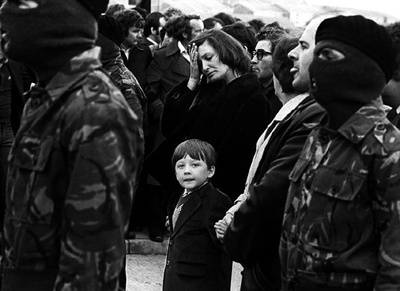 There are no heroes in the saga of Bobby Sands." The Chicago Tribune wrote that "Mahatma Gandhi used the hunger strike to move his countrymen to abstain from fratricide. Bobby Sands' deliberate slow suicide is intended to precipitate civil war. The former deserved veneration and influence. The latter would be viewed, in a reasonable world, not as a charismatic martyr but as a fanatical suicide, whose regrettable death provides no sufficient occasion for killing others." 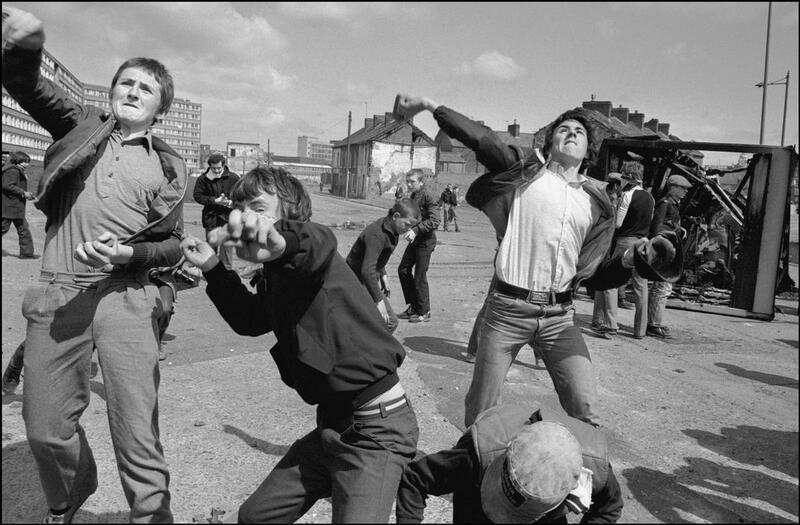 The New York Times wrote that "Britain's prime minister Thatcher is right in refusing to yield political status to Bobby Sands, the Irish Republican Army hunger striker," but that by appearing "unfeeling and unresponsive" the British Government was giving Sands "the crown of martyrdom." The San Francisco Chronicle argued that political belief should not exempt activists from criminal law: "Terrorism goes far beyond the expression of political belief. And dealing with it does not allow for compromise as many countries of Western Europe and United States have learned. The bombing of bars, hotels, restaurants, robbing of banks, abductions and killings of prominent figures are all criminal acts and must be dealt with by criminal law." Some American critics and journalists suggested that American press coverage was a "melodrama". One journalist in particular criticised the large pro-IRA Irish-American contingent which "swallow IRA propaganda as if it were taffy," and concluded that IRA "terrorist propaganda triumphs." Archbishop John R. Roach, president of the US Catholic bishops, called Sands' death "a useless sacrifice". 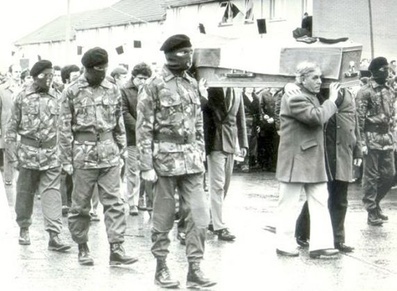 The Ledger of May 5, 1981 under the headline “To some he was a hero, to others a terrorist” claims that the hunger strike made Sands "a hero among Irish Republicans or Nationalists seeking the reunion of Protestant-dominated and British-ruled Northern Ireland with the predominantly Catholic Irish Republic to the south." Some political, religious, union and fund-raising institutions chose to honour Sands. The International Longshoremen's Association in New York announced a 24-hour boycott of British ships. Over 1,000 people gathered in New York's St. Patrick's Cathedral to hear Cardinal Terence Cooke offer a Mass of reconciliation for Northern Ireland. Irish bars in the city were closed for two hours in mourning. In Hartford, Connecticut a memorial was dedicated to Bobby Sands and the other hunger strikers in 1997, the only one of its kind in the United States. Set up by the Irish Northern Aid Committee and local Irish-Americans, it stands in a traffic circle known as "Bobby Sands Circle," at the bottom of Maple Avenue near Goodwin Park. The New Jersey General Assembly, the lower house of the New Jersey Legislature, voted 34-29 for a resolution honouring his "courage and commitment." 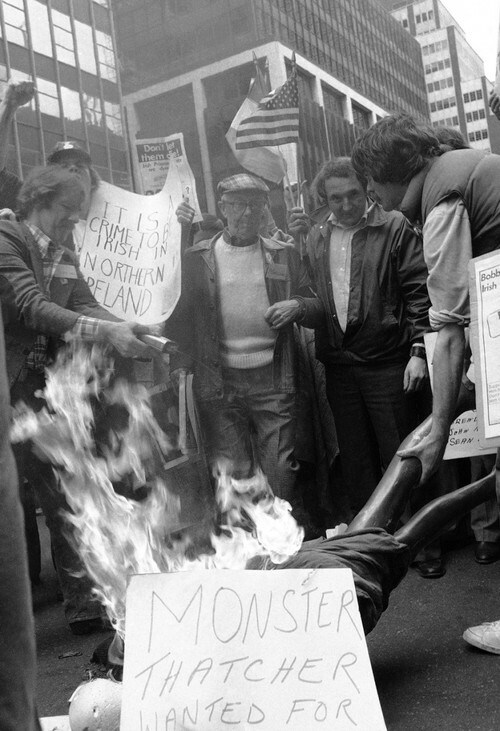 Demonstrators outside the British Consulate to the U.N. in New York on May 2, 1981, burn British Prime Minister Thatcher in effigy using a mannequin during a demonstration in support of hunger striker Bobby Sands. In Tehran, Iran, President Abolhassan Bani-Sadr sent a message of condolence to the Sands family. The government renamed Winston Churchill Boulevard, the location of the Embassy of the United Kingdom in Tehran, to Bobby Sands Street, prompting the embassy to move its entrance door to Ferdowsi Avenue to avoid using Bobby Sands Street on its letterhead. A street in the Elahieh district is also named after Sands. An official blue and white street sign was affixed to the rear wall of the British embassy compound saying (in Persian) "Bobby Sands Street" with three words of explanation "militant Irish guerrilla". The official Pars news agency called Bobby Sands' death "heroic". There have subsequently been claims that the British foreign secretary has pressured Iranian authorities to change the name of Bobby Sands Street but this is denied. The Hindustan Times said Margaret Thatcher had allowed a fellow Member of Parliament to die of starvation, an incident which had never before occurred "in a civilised country." In the Indian Parliament, opposition members in the upper house Rajya Sabha stood for a minute's silence in tribute. The ruling Congress Party refused to join in. A large monument dedicated to Irish protagonists for independence from Britain, including Bobby Sands, stands in the Waverley Cemetery in Sydney, Australia.